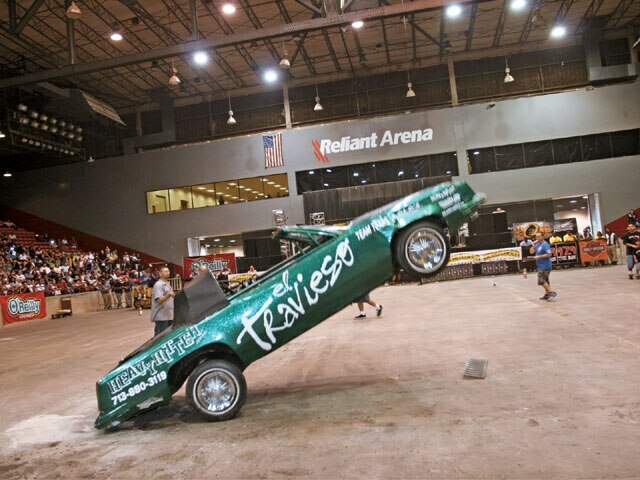 The Houston Tour stop has unofficially become the Texas “super show.” This past July, there were more than 600 show vehicles entered at the only Texas stop on the ’07 Tour. 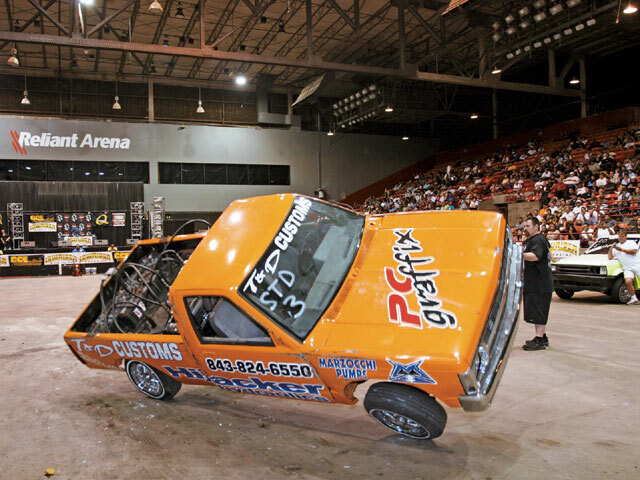 The CCE Hydraulics-sponsored Hop was equally impressive with more than 30 competitors coming out to show their stuff at Reliant Arena. First up was the Single-Pump Hop, where two people came out to try their luck at qualifying for the Super Show at Las Vegas, Nevada, and maybe break a Tour record. 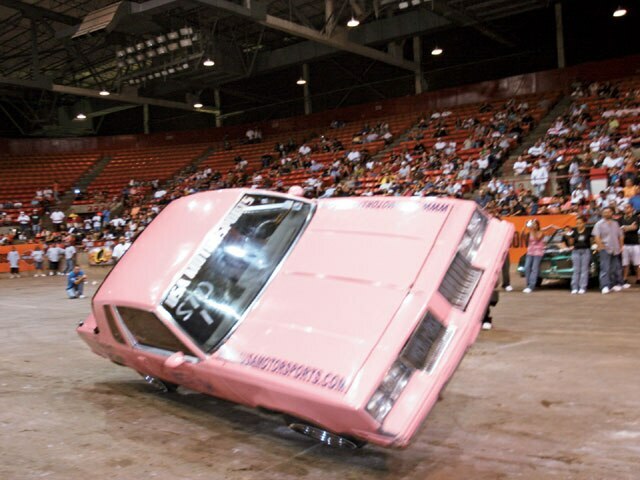 Daisy Salinas’ ’84 Cadillac set the pace at 24 inches. 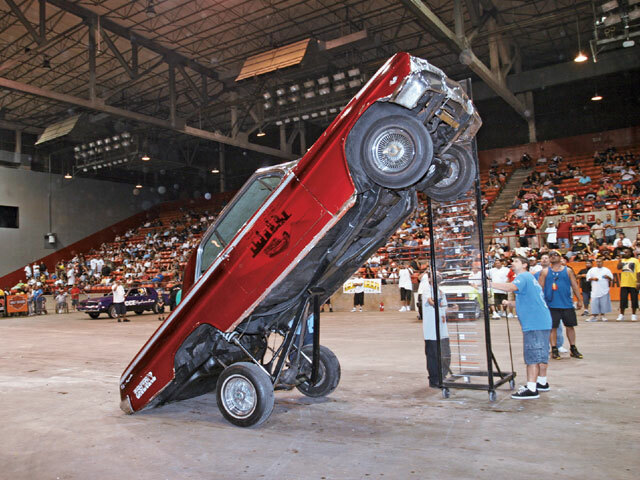 Next up was local favorite “Shorty” Villareal of Shorty’s Hydraulics, who rolled out the shop’s ’64 Chevy Impala, got in a few licks and soared to 68 inches. There were also two competitors in the Double-Pump Hop. Miguel Requena started things off by reaching 44 inches with his ’83 Buick Regal, putting him into the lead. 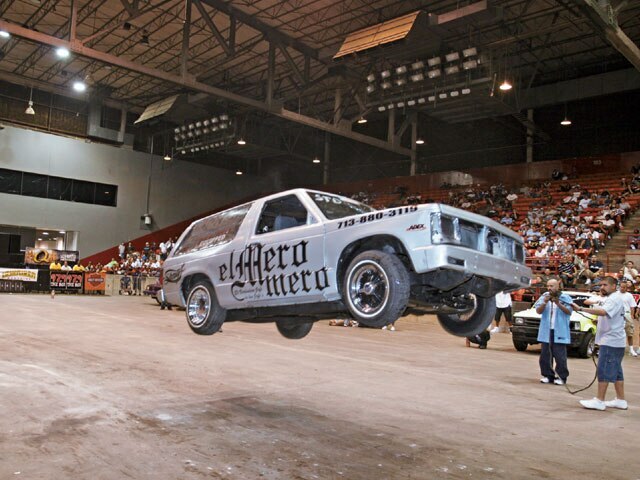 It was then do or die for Rogelio Loera, who brought out his ’87 Chevy Monte Carlo. The blue G-body made it all of the way to 76 inches to win the class. 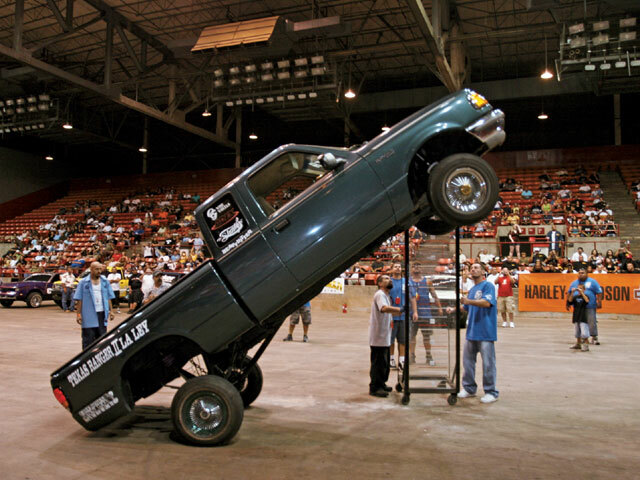 Getting it started in the Truck Hop, Cool Cars and their ’91 Mazda B2200 climbed to 86 inches. 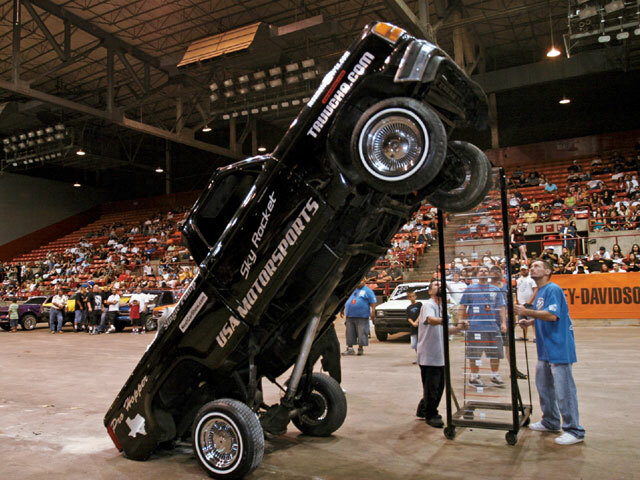 Next up, Shorty’s Hydraulics’ ’92 Ford Ranger squeezed into the lead at 87 inches. 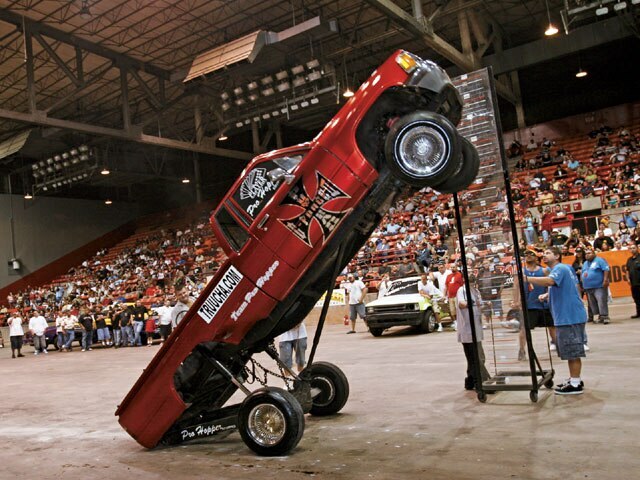 John De la Fuente hit the exact same height with his ’89 Ranger to create a tie for First Place. A field of 10 hoppers entered the Radical Hop, but when it was all said and done, only three would qualify for Vegas. 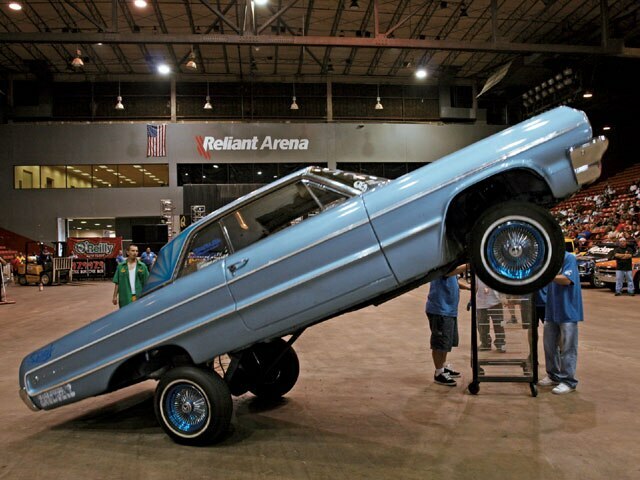 Shorty’s Hydraulics brought out their ‘62 Impala and hit 90 inches. 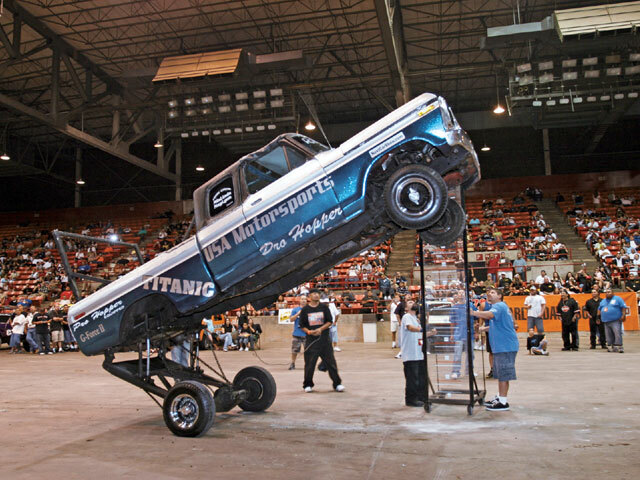 Jose Regalado tied that score with his “Titanic” ’78 Ford F150. First Place was won by Rob Robertson whose ’90 Toyota went to 95 inches to dominate the Radical class. Things were just as interesting in the Street Dance. Cool Cars came out with their Chevy S-10 and scored 20 points to ensure Third Place. Second Place went to Tony Casas, who tallied 24 points with his ’85 Olds Cutlass to lock up a place in Vegas. First Place was won by local favorite John of Shorty’s Hydraulics, who danced the ’86 Chevy Blazer to a near perfect score of 28 points. There were eight guys battling it out in the Radical Dance for a chance to go to Vegas. The cars that had already qualified were still winning events and eliminating the competition. The first to place was Rogelio Loera, whose Cutlass scored 19 points, enough for Third Place but not enough to qualify for Vegas. The Cool Cars ’91 S-10 rang up 21 points for Second Place even though it had already qualified for Vegas. 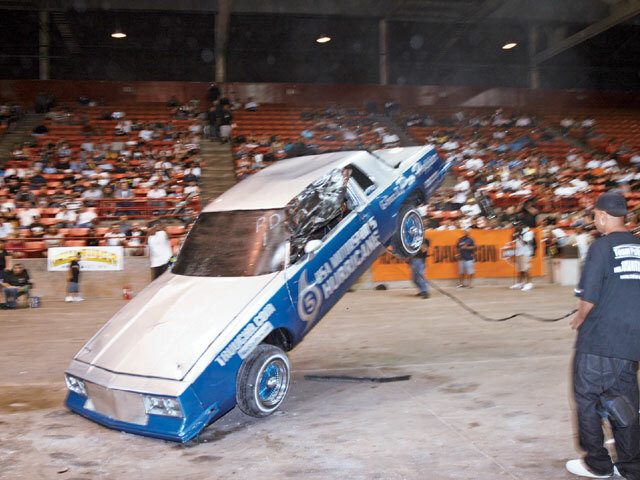 Tony Casas’ ’86 Cutlass was the one to beat as he scored 22 points to win First Place. All in all, the Houston Tour Stop including the Hop was a Texas-size success with all of the Texans and the best of the Southwest trying to show their moves. There were only two more Tour stops after Houston to qualify for Vegas, so we’ll have to see how thing play out. We hope to see you there. Cool Cars took home Third Place with their Mazda. “El Travieso” took home Third Place. The “Titanic” was quick to sink the competition. 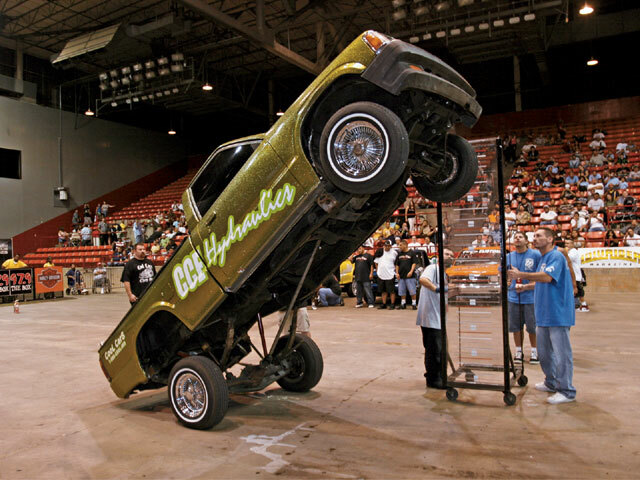 The F-150 reached 90 inches in the Radical Hop. Gilbert’s “Sweet & Low” nailed the side to side action. “El Mero Mero” killed the pancake as it hopped off the ground. Shorty’s ’64 was the top dog in Single-Pump Hop. The CCE S-10 had the crowd going. 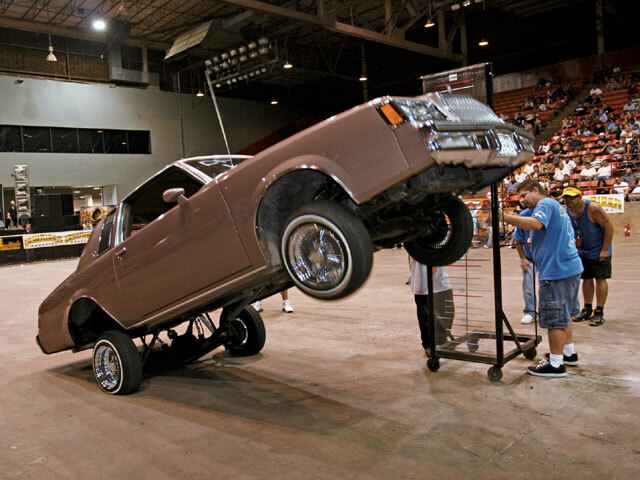 This Monte smashed its bumper on the way to dominating the Double-Pump Hop. 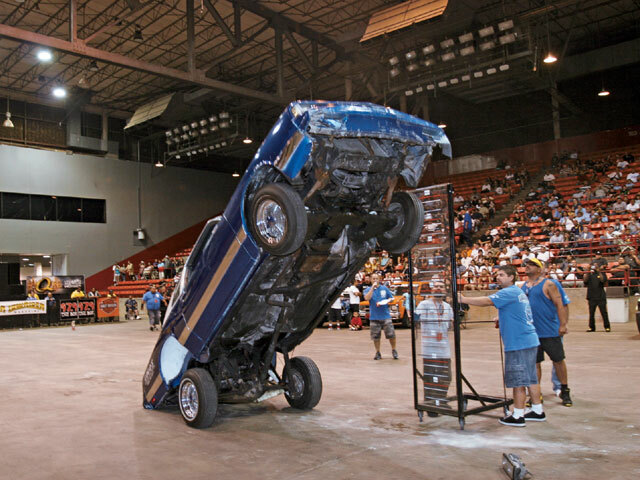 Shorty’s Hydraulics split the First Place spot by reaching 87 inches. Rob Robertson’s Toyota topped the Radical class. John’s truck had to share the spotlight after tying for First in the Truck Hop. “Hurricane” left a path of destruction on its way to blowing away the Radical class. Miguel’s Regal was another local Houston competitor coming out to strut its stuff. 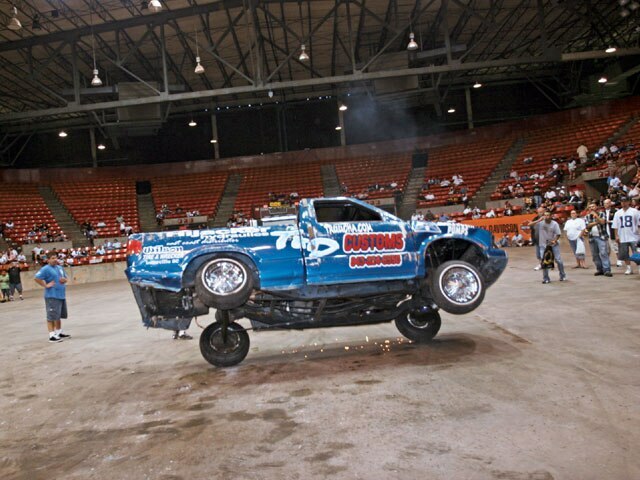 The Cool Cars’ S-10 scored 20 points to ensure Third Place. Shorty’s deuce was on top of things, tying for Second Place.